Mrs. Kelm’s Chocolate Cake is not just a birthday cake…. it’s THE birthday cake! 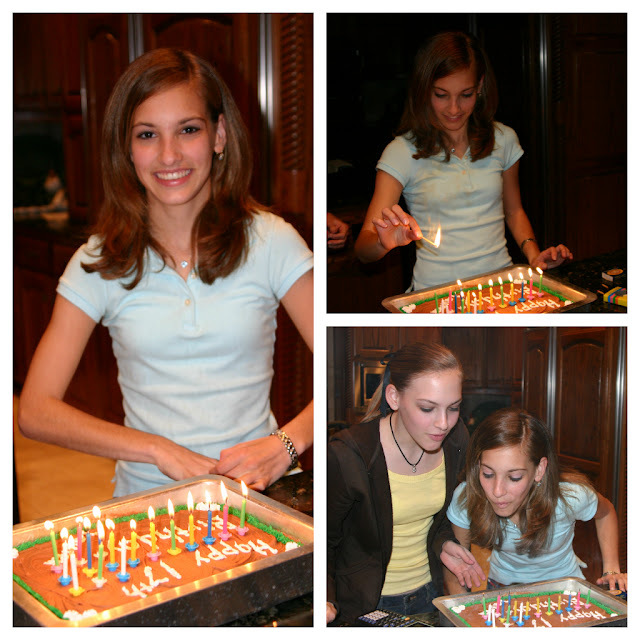 As you can tell by the photos below, my sister Brittany and I were and still are, big fans. The cake has been in our family for years. The recipe dates by to my aunt Jolene’s mother-in-law, Mrs. Kelm… hence the name of the cake. 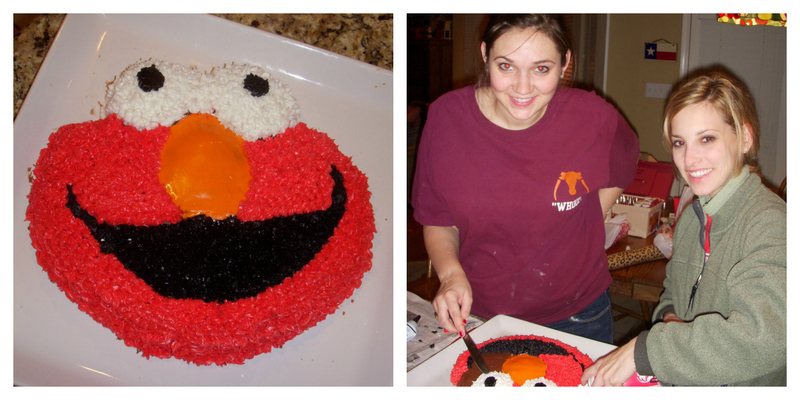 Each year Brittany and I (and my Dad, when it was his birthday), would request this cake. 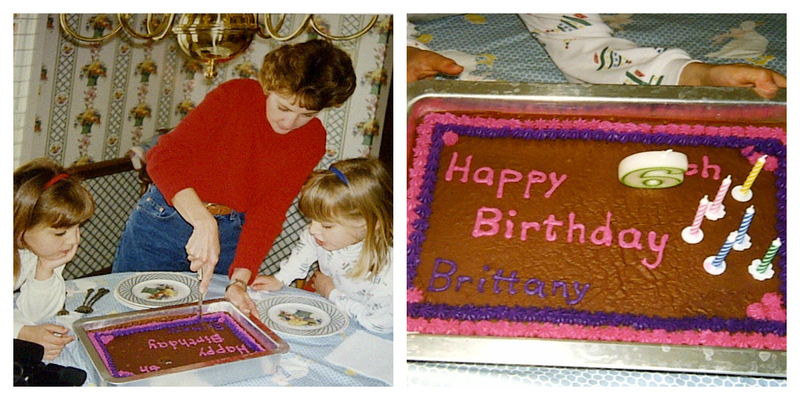 Brittany and I both have birthdays in March, so my mom would have to make it twice in one month! 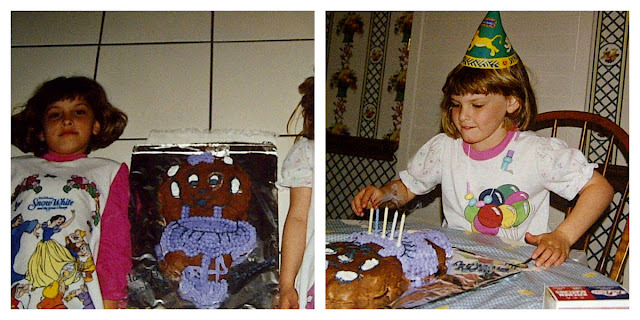 While the base of the cake is a standard chocolate cake with chocolate frosting, my mom would jazz it up by decorating it each year in the design and colors of our choice. When I was little, I loved Barney & Friends, and thus mom made the purple friendly dinosaur for me! 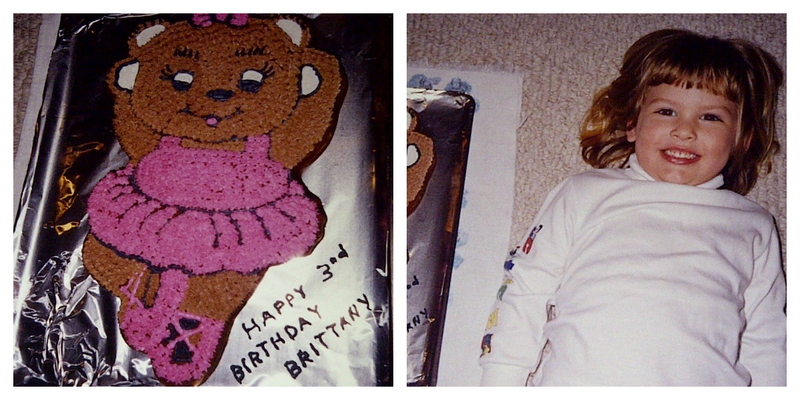 Brittany loved to dance and thus requested ballerina cakes. When we got older, Brittany and I would accompany my mom to the grocery store and pick out two or three of our favorite icing colors to frost the cake with. 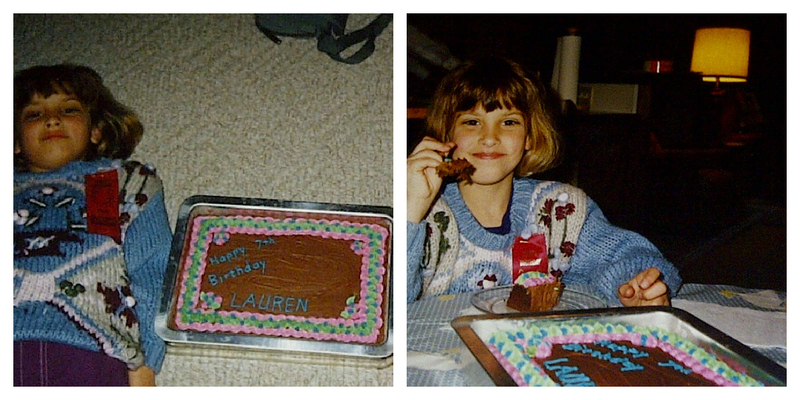 Mom would then decorate the cake by writing “Happy [__th] Birthday Lauren (or Brittany)” while piping a pretty border around the edge. Brittany always picked pink, while I picked the blue and green colors. 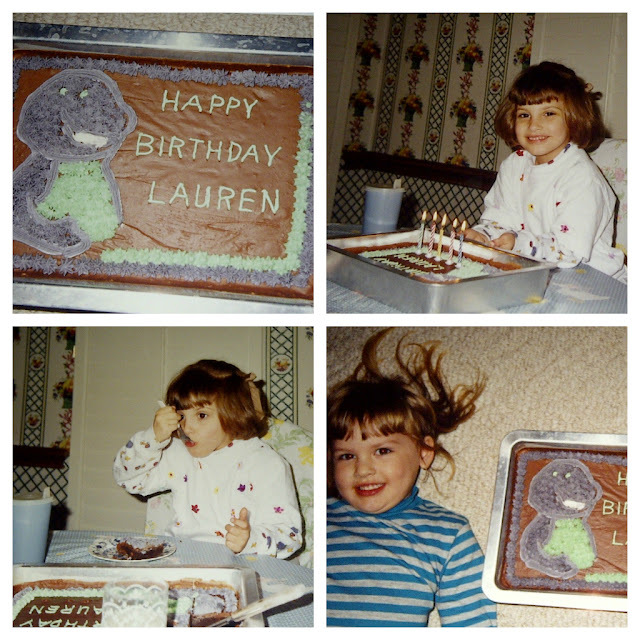 Another funny and kind of weird tradition with this cake are the pictures that go along with it. Each year my dad would make my sister and I lie down on the floor or tile right next to the cake. While the photos are awkward-looking, my dad had a good point – he didn’t want to risk us dropping the cake while we posed for a picture. Quite clever if you ask me…. 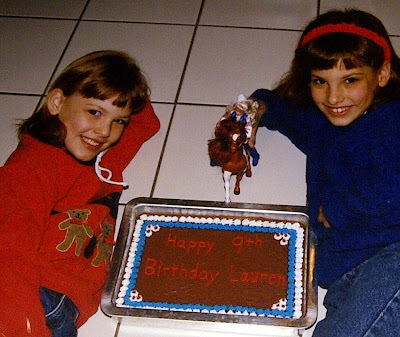 As we got older, I guess my dad trusted us enough to hold the cake without dropping it, thus no more lying on the floor pictures! The history of this cake must go on!! When my sister-in-law Leah asked for a chocolate cake recipe so that she could make an Elmo cake for her son Bear’s 2nd birthday, I quickly told her about Mrs. Kelm’s chocolate cake. Looks impressive don’t you think? Just a few months ago I made Mrs. Kelm’s chocolate cake for my father-in-law Tony. When I have kids, I’ll be sure to carry on my mom’s tradition. Until then, birthday cake anyone? 2. Sift flour, add sugar and salt and resift. 3. Bring to a boil butter, water, and cocoa. Pour over flour and sugar mixture. Add remaining ingredients and mix well. 4. Bake in a greased and floured 9 x 13-inch pan for 35-40 minutes or until toothpick inserted in center of cake comes out clean. 5. Place 1 stick of butter, 3 tablespoons of cocoa, and 5 tablespoons of milk in a saucepan. Mix and heat over low heat; do not boil. 6. Remove from heat and add one box of powdered sugar, 1 teaspoon of vanilla. Mix well and frost cake. 4 Responses to "Mrs. Kelm’s Chocolate Cake"